Ashley Horton Designs: From Ballet, To Birthdays, To the Backyard! Today was my last reveal for the month of May, as a Special Investigator at CSI: Color, Stories, Inspiration. 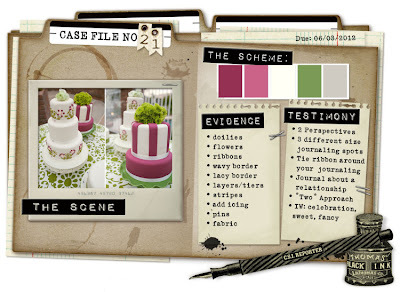 I had so much fun joining in with the CSI Team and was very honored to be invited by Debbi Tehrani, to work with this month's Case Files. When I saw Case File #21, I thought..."purple!!" So not my favorite color, but I decided to take on the challenge anyway, and I think this one ended up being my favorite for the month. Today was also the last day for our product swap with Nikki Sivils at Sketch Support. I worked with Nikki's Audrey collection, which was one of the 4 new releases from W-CHA. It is a great girly collection and I had so much fun with it on the May One Page Sketch. I changed the sketch up, just a little bit, by using one photo instead of two. But for the most part, I kept the basic design of this sketch pretty much in tact. I had a little fun misting on this layout, because I finally got some masks. My sweet friend Angela sent me a little goodie box and lo and behold there were two awesome masks packed away in there!! So excited! I also misted the white doily, just to dress it up a little bit. Are you kidding me? Posting 3 incredible layouts on one post? I need a moment to soak in all the greatness of them! The first ballerina one- SOOO cute! You started with great pictures and I really love the circle border across the bottom and top! Great choice on the black and white photos too! They really go well with the color scheme! Then the girls day out one- I am loving that big banner cluster at the top with the heart in the middle! And the sweet yellow doily behind the title really makes the title pop! And can I just say how much I love the brown hearts floating around the page ! They look like they are falling from your edge paper and I love that! I am hoping to do this sketch, but I am running out of time! PS I thought you might like the butterfly masks! :) They look perfect on your page! Your construction crew layout is GORGEOUS! I never would have guessed that it was G45 paper! I feel the same way you do about G45, so I may have to reconsider! 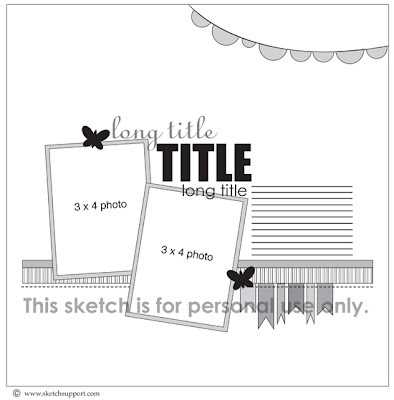 This is a layout I would take a picture of in a scrapbook store to copy at home later! Now I have it saved on my computer! Even better! Once again, all the perfect embellishments on this layout! Even used packaging! Ashley, you are AMAZING! All three gorgeous pages, Ashley! Loved having you as our Special Investigator. That page is so darling. That middle one is precious too! Loving the banners and how you added the pom-pom trim--such a sweet touch! And how cute is the "sandcastle construction crew."